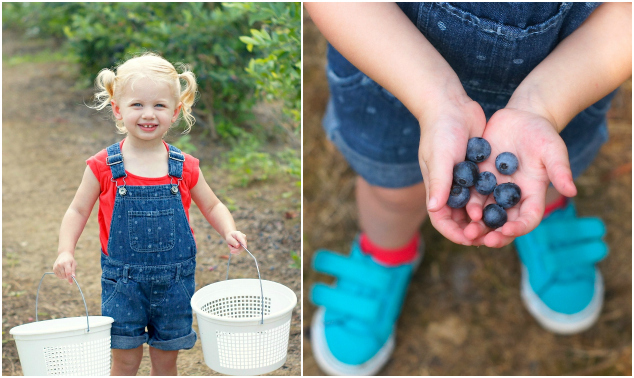 Last week, Fearless Baby and I went on an adventure – we went blueberry picking! I was apprehensive, as we had never been to this farm before (and had never been blueberry picking, period) and it was a 45-minute drive away. If you’re familiar with toddlers, you know that combining a new activity with a fairly-lengthy drive is risky. Will it be a fantastic adventure? Or a catastrophe? In our case, it turned out wonderful. It was a weekday morning, and the farm was quiet, which made our berry-picking delightfully leisurely. The overcast skies kept the temperature from getting too high (and made for excellent lighting for taking pictures). And my daughter had SO much fun. She quickly figured out which berries to pick (the plump, dark blue ones), and which ones to leave behind (the green and pink unripe ones). After an hour of picking, our baskets were full. Lemon and blueberry is one of my favorite flavor combinations, so I knew I wanted to make a lemon/berry dessert straightaway, and settled on this Lemon-Blueberry Cream Pie. And heavens, it turned out amazing. It has a sweet graham cracker crust, topped with a tart no-bake lemon cream cheese/pudding layer, topped with fresh blueberries + jam, then more lemon cream cheese/pudding, and fresh whipped cream. 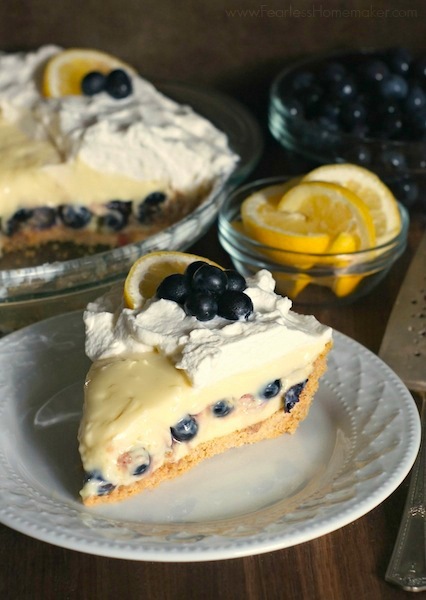 The combination of the crumbly crust, the smooth / creamy lemon layer, and bright pops of fresh blueberries is divine. We all loved it so much that we’ve decided this should be a summertime tradition: A mama/daughter trip to the farm for fresh berries, followed by making this delicious pie for the whole family to share. And Nashville friends, I can’t recommend Kelley’s Berry Farm highly enough. Warm, welcoming employees, easy to find, and delicious berries. Take a look at their Facebook page for more information/hours if you want to visit, too! Stir together first 3 ingredients — graham cracker crumbs, sugar, and melted butter — and press evenly in bottom and up sides of a 9-inch pie plate. Beat cream cheese, sweetened condensed milk, and powdered sugar at medium speed with an electric mixer (or stand mixer) until creamy. Add pudding mix, lemon rind, and lemon juice; beat until well-blended. Spread half of lemon mixture evenly into prepared crust. Stir together blueberries and preserves; spread evenly over lemon mixture. Spread remaining lemon mixture over blueberry mixture; cover and chill for 2 hours or until set. Beat whipping cream with an electric mixer until soft peaks form, and spread around outer edge of pie, forming a 3-inch border. Garnish, if desired, with fresh blueberries, lemon slices, and/or mint leaves. It’s perfect for the summer!! I think I will try to make this for my friends next weekend Looks lovely! I love blueberry picking! And this pie looks heavenly. I love blueberry picking! I went this summer and had a blast. Nothing like eating food seconds after it was picked. This pie looks so yummy. I love the combo of blueberry and lemon, they pair so well! I’m so glad the trip was a success! Nothing like picking your own berries! 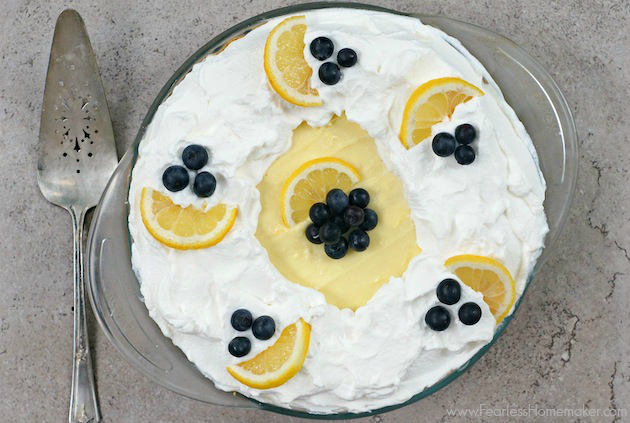 I bet this pie is just amazing, I love lemon-blueberry combos, so refreshing! Cute pictures!! Amy, this looks amazing! I’m going to send this link to my mom. She makes an amazing lemon ice-box pie. p.s. your daughter is so adorable!! Yummy, yummy! I am a big fan of blueberries and your cake looks absolutely amazing. Yum! Yum! This looks like heaven in a pie dish! And how adorable is she?! The pigtails, the overalls – too cute! !